Anybody wishing to sample the walks organised by the Ramblers’ Association of Malta may join any one of them. The full winter programme of walks may be accessed on the association’s website. However, it is important that those deciding to join walks for the first time act prudently, and start with a walk that is graded easy if they are not certain they can take the moderate or harder walks. All the walks are graded, and the description of gradings may be found at the beginning of the full programme. 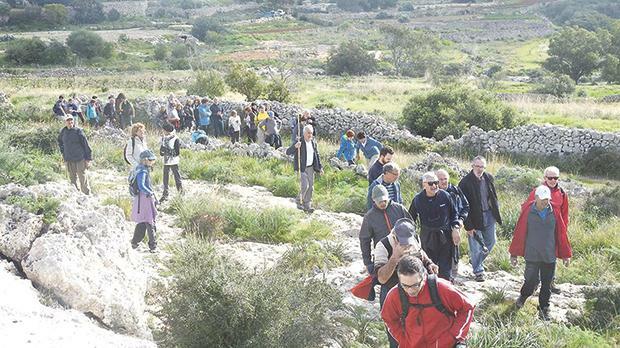 Tomorrow the association is organising a walk between Żebbuġ and Siġġiewi. It is a pleasant, relatively easy meander along country lanes, taking in San Blas chapel, Wied Ħesri, Ta’ Bordin ridge and Wied Baqqija. The route will take some three hours and starts at Żebbuġ parish church. On Saturday the association crosses over to Gozo. The route follows quaint rural paths from Marsalforn through Żebbuġ and Għasri ending up at Victoria. It is a moderately difficult walk of some three hours, starting at Mġarr ferry terminal at 8.55am, taking Bus 322 to Marsalforn. For more information and advice call 9949 7080 or 7733 2433.